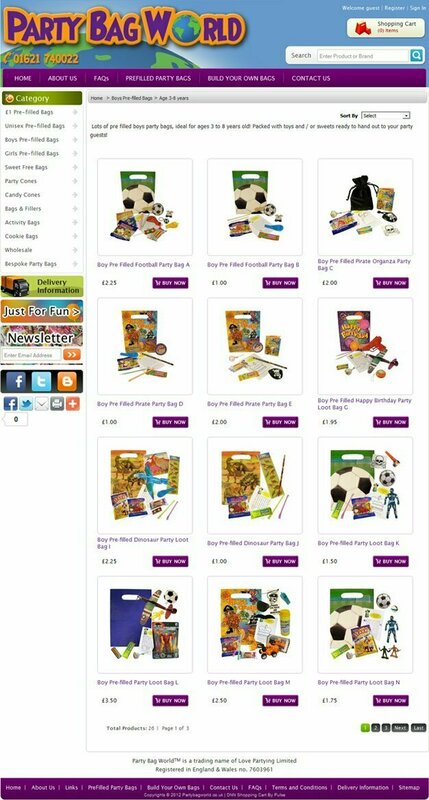 Party Bag World is a new business venture selling party bags, party cones, toys, sweets and novelties for children and adults. They required a small scale ecommerce website which would enable them to easily manage their product catalogue and update the site and which could be customised to match their planned business model. They needed their site to be search engine friendly. Above all they wanted a design that was vibrant and friendly with a straightforward shopping process. Our solution was to develop the site using the Pulse Solutions DNN Shopping Cart. This is built on the award winning open source DotNetNuke platform and has a range of flexible modules which can be set up to reflect the selling process of the ecommerce business. We worked closely with the client to come up with a lively custom skin design with a welcoming feel. The homepage banner can be changed via a one click process in the admin panel to highlight seasonal promotions and special offers. The client can update all static page content using the DNN content management system. A csv upload was employed to add products to the site initially. A product can be displayed in a number of categories to maximise exposure to the customer. The client is making use of the meta tags management within the admin panel to optimise these for search engines and the catalogue has an automatic feed to Google shopping. Google Analytics is being used to guide further search engine optimisation. Promotion through social media is important to the success of this site so Face book and Twitter are integrated. The newsletter system is integrated with 3rd party email marketing software to enable the client to create segmented lists for targeted email campaigns.